This house on White Sulphur Springs Road is six miles west of Main Street, Saint Helena in the heart of the Napa Valley. Located 500 feet above the valley floor, the house sits on sixty acres of wilderness which borders California State park land and Iron Mine Creek. 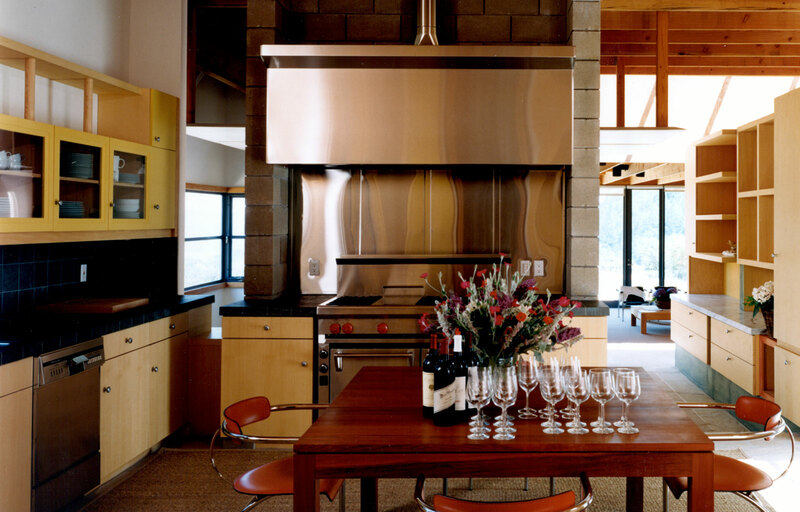 The house itself is sited immediately above a hillside vineyard on a long, narrow spit of land which is accessed from the west and looks out over a small vineyard easterly to the valley. The driveway swings a broad 180 degree turn amidst a grove of native oaks, addressing the entrance of the house which is defined by a 200 foot long uninterrupted wall bisecting the house beyond. 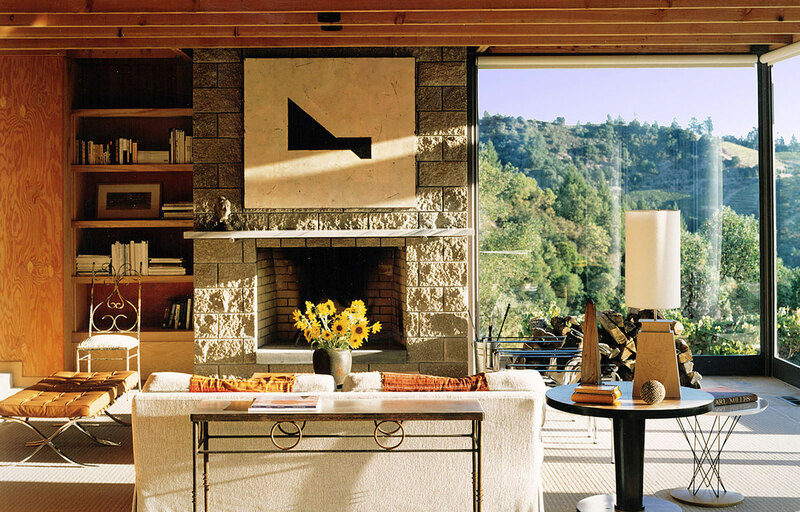 Beginning in the driveway, the wall passes through the entrance, and down into a central gallery, culminating in a living room defined by three walls of glass and two flanking fireplaces. The progress of the house descends through a series of stone steps and landings which mirror the descent of the hill and form the basis of the plan. 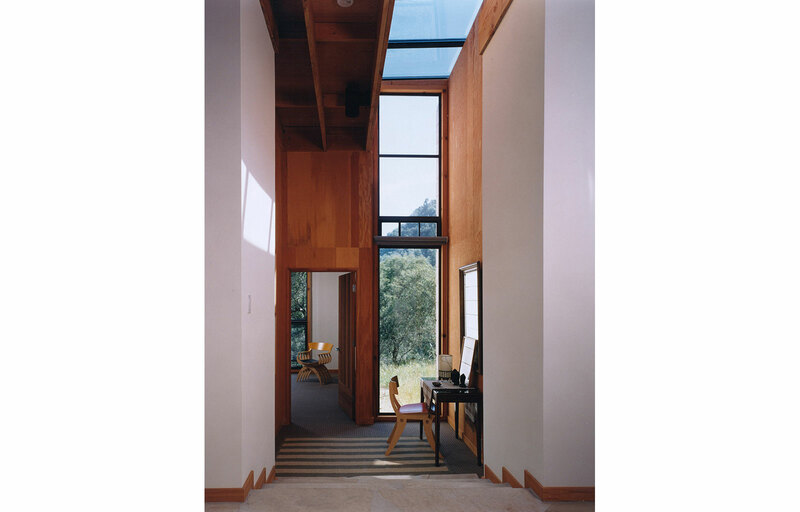 Over the length of the defining wall in the house, four glazed thresholds separate the longitudinal procession of the building with alternating bands of glass at floor and ceiling, giving slivered views of the landscape right and left. The wall further defines the house by separating private spaces (bedroom and baths) and communal spaces (gallery, kitchen, dining, studio, and living area). 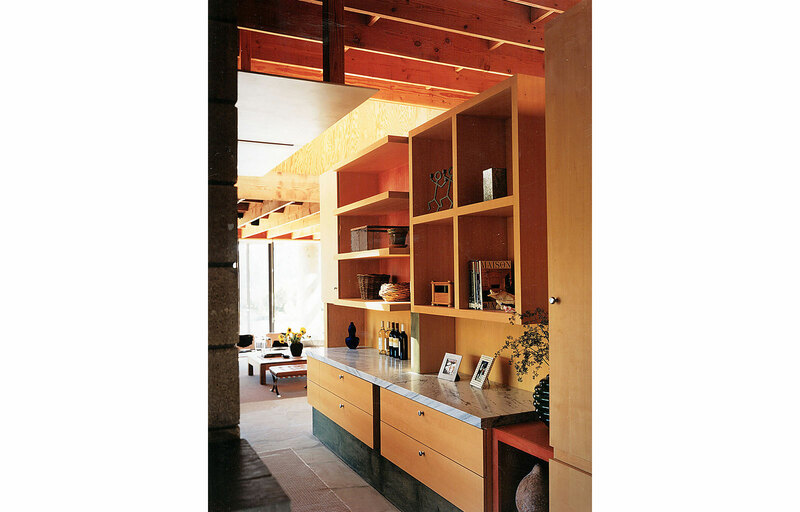 Structural finishes in the house are elemental: sandblasted plywood panels, plastered white walls, and rough-sawn cedar doors and window frames set against a backdrop of cabinetry millwork in domestic quarter-sawn ash.